Production of copper metal gutters. Manufacturing, livnevok, funnels, watering cans, vodootboynikov, knees. Metallichekie gutters - the perfect complement to the metal roof. Usually they are made of metal the same color as the main roof. Metal drains (gutters, pipes, sinks, vodootboyniki, fixing gutters and pipes) are made on special bending machines, both universal and its own production. 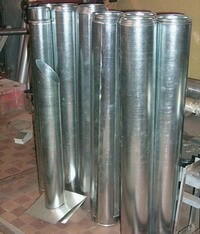 The dimensions of the metal runoff depend on the size of the house, the length of eaves, the customer's wishes. There are standard sizes of drain pipes, which is primarily due to the width of the roll or sheet metal. Width of the pipe is chosen so that the flow of metal in the manufacture of metal (copper) drainage was minimal. All work on the production of metal or copper pipes, watering cans, gutters made in the shop, after making measurements or in the presence of precise drawings. After cutting a metal piece bent on bending machines, and then clinch on special equipment. Over the years we have found a way to reduce the cost and to simplify the manufacturing process of metal gutters. 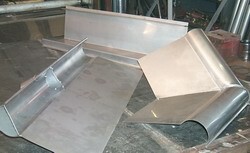 To manufacture high-quality metal gutter system uses a variety of special equipment.